Honduran youth activist Eduardo Enrique Urbina Ayala continues to be the target of state misinformation months after he fled the country fearing for his safety. 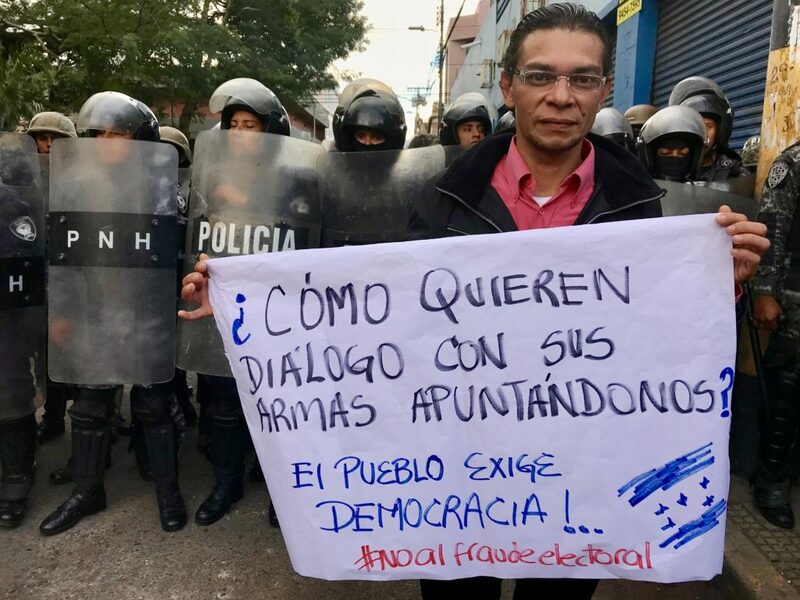 Three weeks after the contested Nov. 26 presidential election, marred by widespread allegations of election fraud, a social media smear campaign accused Urbina of setting fire to an army truck during opposition protests in the capital city Tegucigalpa. But he had left the country for Costa Rica five days earlier. Despite his alibi, authorities issued a warrant for Urbina’s arrest on Dec. 19 for aggravated arson and use of explosives. Urbina has remained in Costa Rica, fearing for his life if he returns to Honduras. The Committee of Relatives of the Disappeared in Honduras (COFADEH), the human rights group that helped Urbina leave Honduras safely and has advocated on his behalf, confirmed Wednesday that Urbina was in the care of the United Nations High Commissioner for Refugees as an asylum seeker in Costa Rica. COFADEH dispelled the rumor originating from Interpol authorities in Honduras and circulated in local media Wednesday that Urbina had been detained in Costa Rica and could be returned to Honduras, where he would face arrest. According to COFADEH, Nicaraguan immigration authorities illegally detained Urbina for 72 hours when he crossed the border this week to renew his visa in Costa Rica, valid for three months. He requested asylum upon returning to Costa Rica and was under UNHCR care. He was not detained by Costa Rican authorities and does not face deportation to Honduras, COFADEH reported. When the military vehicle went up in flames, anti-government demonstrators has been flooding the streets for three weeks to protest what they said was a stolen election and consolidation of a dictatorship under President Juan Orlando Hernandez. Hernandez overcame what had appeared to be an insurmountable lead for Opposition Alliance Against the Dictatorship candidate Salvador Nasralla after a series of delays and technical glitches with the election results reporting system, including an hours-long blackout. The Organization of American States called for fresh elections in light of the rampant irregularities and uncertainty of the results. The United States recognized Hernandez’s win. According to human rights groups, at least 38 people have been killed in the post-election crisis. The United Nations human rights office has reported that military and police shot dead at least 16 protests and that the military police in particular “used excessive force, including lethal force” against protesters. Despite a deepening human rights crisis, authorities and mainstream media repeatedly seized incidents like the army truck being set on fire in Tegucigalpa to steer the narrative around the protests and stigmatize the opposition. As Urbina put it when he spoke to me by Skype in early February, the detailed profile that circulated on social media identifying him as the culprit gave Honduras a name, face, and home address to attach to the chaos. 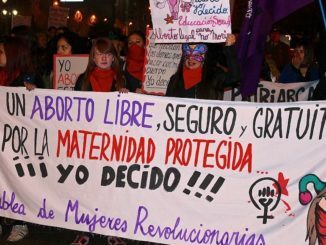 It wasn’t the first time Urbina, who got involved in left-wing politics at the age of 14, had been targeted for his activism. As a member of the progressive Libre Party and more recently the Opposition Alliance Against the Dictatorship, as well as the anti-capitalist organization Los Necios and the University Students’ Movement against creeping privatization in higher public education, Urbina’s anti-establishment politics were no secret. Back in 2015, media reports linked him to coordinating an attack against police, pushing him to leave the country for 15 days as a security precaution. Then in 2017, after the May 1st International Workers’ Day march in the capital, a police officer flanked by two people dressed in civilian clothes shot at Urbina before detaining him for 26 hours. Urbina claims police threatened him while in detention and told him the only reason they didn’t kill him was because they didn’t want to. After the Nov. 26 election and allegations of electoral fraud that sparked mass protests, the accusations began to fly once again. A pamphlet with a detailed profile of Urbina – including his name, photo, and home address – circulated on social media identifying the 22-year-old history student as the coordinator of a “criminal group responsible for vandalism and violence” with knowledge of making homemade explosives. He started to fear for his safety and fled. In the wake of the election, local level activists have increasingly been targeted in such smear campaigns. 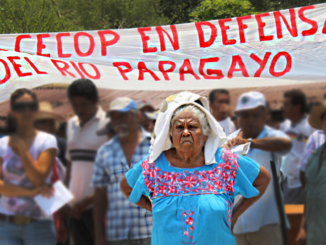 According to community reports, state intelligence profiling local activists has honed in on communities or barrios that have been particularly active in anti-government protests. 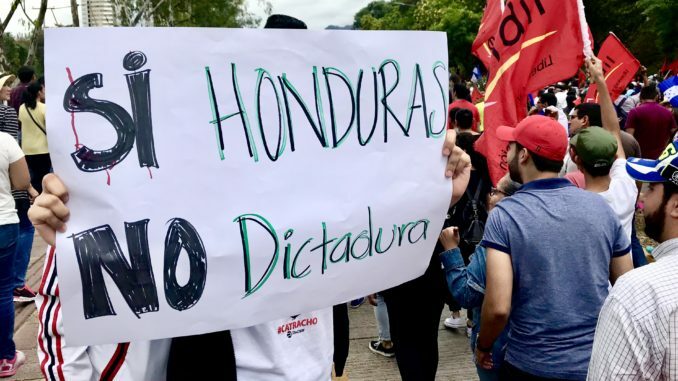 Sociologist Eugenio Sosa, an expert on the history of social protest in Honduras, argued in an interview in January that the most troubling part of such criminalization campaigns is not the development of profiles themselves. “The problem is the establishment of links and responsibility that these campaigns make,” he said. This makes social leaders more vulnerable to state and paramilitary violence. Urbina is one of dozens of anti-fraud activists accused of crimes such as arson since the election. Longtime activist Edwin Espinal, for example, is awaiting trial in a maximum security jail for charges of arson and property destruction. Rights advocates say Espinal is one 22 political prisoners linked to post-election repression but accused of charges that are not explicitly political. Authorities detained him on Jan. 19, the eve of a national opposition protest, based on intelligence linking him to vandalism to the Marriott Hotel in Tegucigalpa during an opposition protest a week earlier. State forces harshly cracked down on protesters that day, but parallel to the media spin around the flame-engulfed military vehicle leveraged to incriminate Urbina, corporate media coverage honed in on the damages to the Marriott, not the state repression. Incidents of vandalism, which many believe to be provoked by government infiltrators organized by military intelligence, were repeatedly manipulated in the wake of the election to delegitimize the groundswell of outrage rocking the country in nationwide protests. Urbina, a history student at the National Autonomous University of Honduras, was quick to point the parallels between the plight of anti-government activists in Honduras today and in the 1980s. 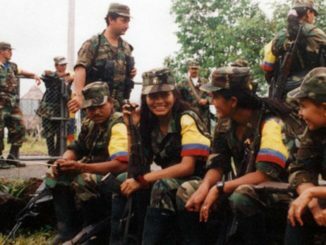 In the Cold War-era, the secret military unit Battalion 3-16 similarly profiled suspected opponents of the U.S.-backed regime. According to a 1995 expose in the Baltimore Sun, the CIA-trained Battalion 3-16 killed or disappeared at least 184 people between 1980 and 1988. It also submitted victims to torture techniques including suffocation, electric shock, and psychological torture, among other methods, inside a clandestine military prison. 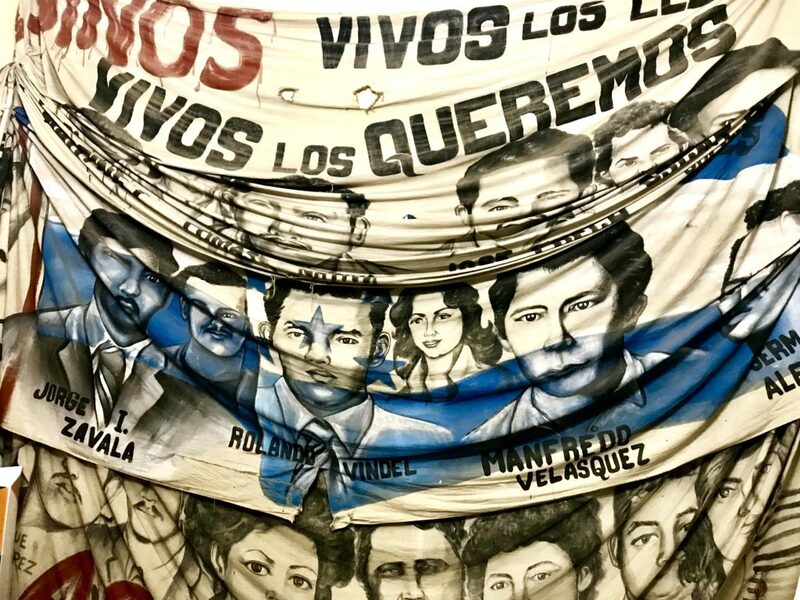 The death squad’s use of forced disappearance — abducting victims and making them “disappear” without a trace — sewed fear to discourage radical political organizing. Human rights defenders warned of the return of 1980s-style death squads in the wake of the 2009 coup when the architects of 1980s state terror held top advisor positions in the coup government. Billy Joya, for example, former head of Battalion 3-16 and a graduate of the U.S. School of the Americas, was a top aide to de facto president Roberto Micheletti. Amid a spike in nighttime raids, targeted criminalization, political murders, and other abuses since the Nov. 26 election, human rights groups have against raised alarm about the deadly reemergence of 1980s death squad tactics. Sosa argued that the situation may be even more precarious today than in the 1980s. Back then, he said, anti-government activists operated with an understanding that they were living under a dictatorial regime. Today, although pro-democracy demonstrators slam Hernandez’ government as a dictatorship, there is still an expectation that some extent of democratic guarantees will be respected. “It’s more dangerous,” Sosa said, “because theoretically (guarantees) exist, but in practice they are permanently violated.” In a context of de facto disregard for human rights, including the right to peaceful protest, waging resistance with assumptions that some semblance of democratic norms will be upheld increases vulnerability under the new state terror. The situation has pushed Urbina, who has dedicated his youth to activism, to seek asylum abroad as the crisis of democracy and human rights at home shows no immediate signs of improving.